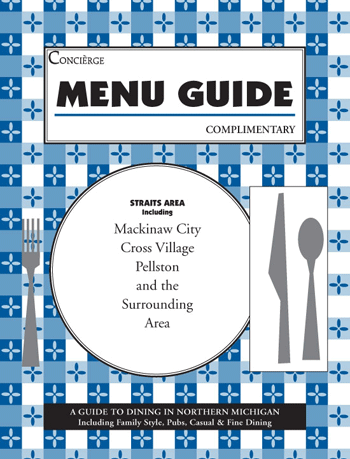 Concierge Publications Prints High-Quality Guides to be Your Own Concierge for Northern Michigan. Concierge is the first publication created by Concierge Publications and the one that still informs visitors and residents with the best in things to do in Northern Michigan. Concierge is on the coffee tables of area homes and hotel rooms because it it filled with a complete calendar of events, stories and more. Our covers always feature the work of an area artist. It is such a delight to deliver an issue when it first debuts as people grab it right out of the box to see what artist is on the cover. Three issues of Concierge are published each year and are distributed throughout Northern Michigan in Petoskey, Harbor Springs, Charlevoix, Boyne City, Indian River, Mackinaw City and more. The Harbor Springs Visitors Guide is the one publication that Harbor Springs residents, visitors, and summer residents keep handy to know what to see and do in this community. Concierge Publications has published the Harbor Springs Visitors Guide for nearly 15 years. This publication is, like Concierge, delivered to businesses, places of lodging, area chambers of commerce and more and is, of course, free! 30,000 copies are delivered each year. The Northern Michigan Map Guide is one of a kind in the north country--a full color, high quality map that continues to wow visitors and businesses every year as it has since 2002. The Northern Michigan Map Guide includes a county map and detailed maps of area communities. There's also a Business Index with color coded locations on the map. We distribute 30,000 copies annually to over 100 area locations, and as always, it is free to the public. All About Petoskey in Northern Michigan - Links to Everything Up North in Petoskey! Concierge Publications Serves Northern Michigan!